In our previous post we have seen that the writer of BPL3603 was especially interested in Van Helmont´s Dageraed because of its recipes to which he added notes about personal experiences to prove efficacy. There I wondered if we would find the same practice in his selections from some of Van Beverwijck´s writings. The parts taken from Van Beverwijck can be found near the very end of the manuscript. They are not placed on their own, like the citations from Van Helmont, however. 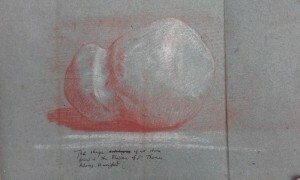 Instead, they are interspersed with copies from another source, a master Wilm Reijmers. It is the latter’s remedy for breaking the stone that appears to have renewed the writer´s interest in the subject of stone breaking remedies in general and in some of Van Beverwijck´s writings more specifically. He had already included remedies for bladder stones within the alphabetical scheme of the manuscript. 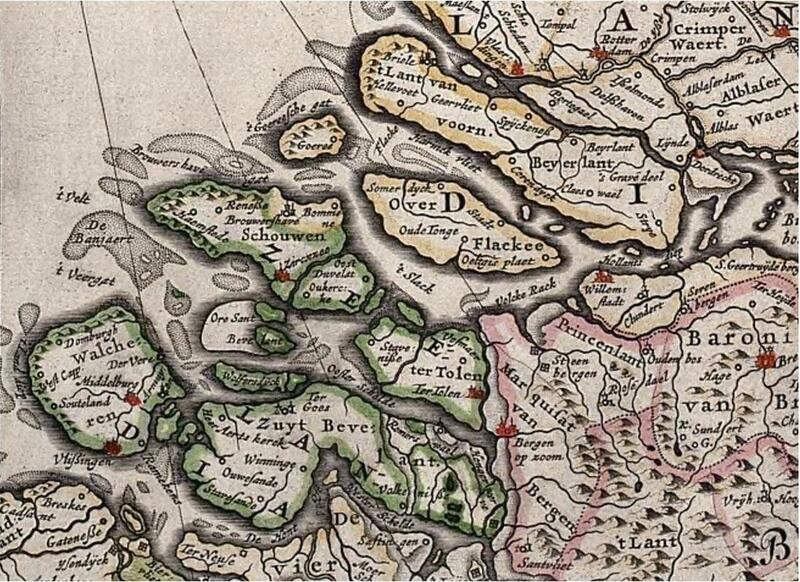 Goeree was a southwestern island of the Province of Holland, shown here on a cutout from a map of the Republic of the Seven United Netherlands (1664-1665), from the ‘Grooten Atlas; oft, Werelt-beschryving; in welke ‘t aertryck de zee en de hemel wordt vertoont en beschreven’ by Joan Blaeu. Middelburg is shown in red in the bottom left corner, Rotterdam and Dordrecht in the upper right. Courtesy of the National Maritime Museum in Amsterdam. What follows is an account of events as told by master Reijmers, and confirmed by a burgomaster of Goeree, a Mr. Klimmert. Two children were suffering greatly from the stone and the local stonecutter Sasbout had been called in. After visiting the children he declared both had quite a large stone in the bladder and there was nothing else to do but to remove them by cutting. One of the children came from a rich farmer’s family. He was operated for the stone and died shortly afterwards. The parents of the other child were poor, and were therefore asking to gather the money for the treatment from church gifts. The church masters, however, didn´t think it advisable to hand over the money, fearing what had happened to the other child. At this point Reijmers got involved. He said he could easily break the stone inside the body, that is, if a living hare could be provided. It wasn’t hare season though. 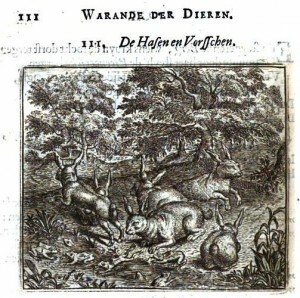 Copper engraving by Marcus Gerards (1521-1590) to the fable The Hares and the Frogs as told by Jean de La Fontaine (1621-1695) and translated by poet and playwright Joost van den Vondel (1587-1679) in Vorstelijcke warande der dieren (Amsterdam 1617, 1730). The next thing we are told is that the boy himself, still greatly pained by the stone, came across a hare caught up in the bushes behind his fathers´ house. In a great struggle, that attracted the attention of neighbours and injured the child himself, the child managed to get hold of it and bring it to his parents. They told master Reijmers what happened, and he cured the child as described above. 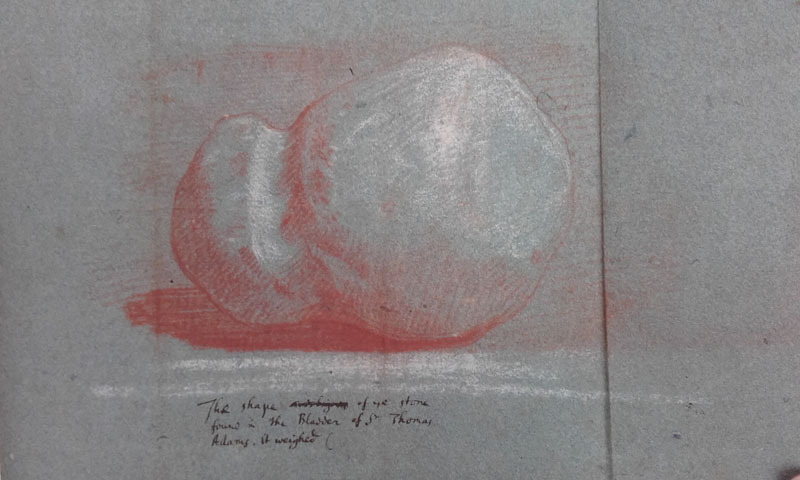 Reijmers explained that when put together, the grit from the child´s urine (which was collected in a blue cloth) would have made a stone the size of a small chicken egg. The author of BPL3603 went on to add that Reijmers successfully treated several others in this way afterwards, to great wonder of the operator (this most likely referred to Sasbout). It is clear that the compiler of BPL3603 shared master Reijmers´ and Sasbout´s wonder at the incident on Goeree. While Reijmers wondered at how the hare was caught, and Sasbout wondered at how Reijmers remedy was successful, the compiler ended his account by praising God. “God alone is the glory, that has giving natural things such power and the people its use,” he wrote. I think we can learn several things from this anecdote. Stone found in the bladder of Thomas Adams, late 17th century. Royal Society Classified Papers, vol. 14i, document 22. Reproduced by permission. Firstly, on a social-historical level, we saw how poor families could make an appeal to the church for financing medical care. As lay people in medical issues, the council weighted the costs and risks of the operation, both financial and social. Secondly, undergoing an operation for the stone was expensive and something more readily undertaken by the wealthy. However, it was not safer. In this story, the poor child was better off. Finally, the main function of the anecdote was to show that the remedy was effective, similarly to the way the author used Van Helmont to prove the efficacy of remedies for the plague. Realising this, I began to notice that the pattern in how the writer of BPL3603 processed the medical knowledge he came into contact with, repeated itself in what he selected to copy from Van Beverwijck. My next post will be dedicated to these choices, while Sietske will first investigate more recipes by Van Helmont. Is that another case in which a recipe was personally passed on to the compiler of BPL3603? Two famous stonecutters by the name of Sasbout were active in the area around this time and are mentioned in contemporary sources. 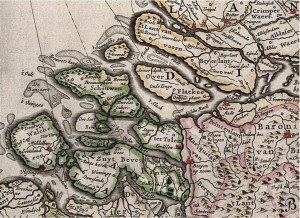 The Jakobus Sasbout who was operator in Middelburg and Jacobus Sasbout Souburg, operator in Dordrecht, might have been the same person, especially since Souburg is a village near Middelburg. A.J. van der Aa., Biographisch woordenboek der Nederlanden (Haarlem: J.J. van Brederode, 1852-1878) part 17-1, 133. I’m curious. How would a live hare be useful in treating bladder stones? Intriguing right! It´s a pretty strange situation that is conjured up, using this struggling, very alive hare in a remedy. To clarify, while the recipe calls for a live hare, it is implied that the hare is very much dead soon into the preparation of the remedy. I think the clue might be in the importance of the hare´s blood, mainly because the recipe expressly says that it should be included. I´ll be sure to get a bit further into this question in my next post on the passages taken from Van Beverwijck. It remains to be seen whether the compiler of the manuscript shared our interest. Perhaps someone here has an idea of why the aliveness of the hare might have mattered so much, particularly to the treatment of bladder stones. Thank you for the reply! If it is the hare’s blood that is the real ingredient that goes into the medicine, I think it makes more sense (to me at least). Traditional folk medicine in East Asia attributes special healing/nutritional value in the “fresh blood” of hunted game. I think similar ideas can be seen in Early Modern Europeans who gathered to drink the blood from a recently beheaded criminal. 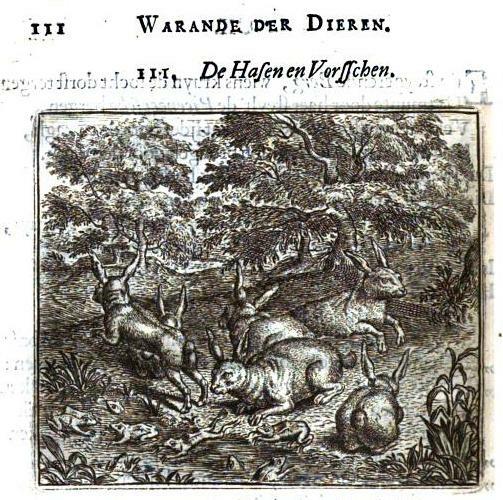 Now I’m curious whether such ideas (concerning animals) were circulated in Europe as well.